Recent water-related events - from extreme droughts across the southwestern United States to flooding in central China - provide vivid examples of the potential impacts of water on people, businesses, and local infrastructure. To assess and respond to increasing water risk globally, the World Resources Institute (WRI) is launching the Aqueduct Alliance, a consortium of leading water experts from the private and public sectors, NGOs, and academia. Founded by WRI, Goldman Sachs and General Electric, the alliance has added Bloomberg, The Dow Chemical Company, Talisman Energy, and United Technologies. 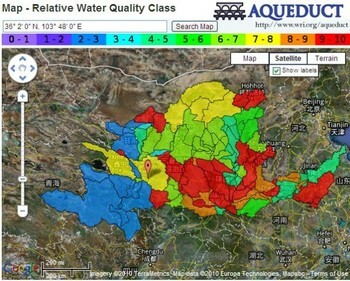 The Coca-Cola Company is also engaged and will be providing an extensive global database of once proprietary water risk information to support Aqueduct’s work. In a survey of 150 large corporations conducted by CDP Water Disclosure, nearly 40 percent of responding companies indicated that they had already experienced disruptions in operations, increases in expenses, and other detrimental impacts related to water. Against a backdrop of rapid population growth and climate change, government entities charged with managing water resources are also increasingly concerned with water-related disruptions and seeking viable approaches for mitigating risks.